In the first century A.D., the Roman historian Apicius wrote about a sweet porridge made of boiled whole spelt kernels (an ancient form of wheat) called Apothermum, the precursor of the Sicilian dish, CUCCIA. I was so enamored with my honey-yogurt-rye-berry breakfast bowl that I started looking for whole-kernel dessert recipes, and came across the Sicilian dish cuccìa, which I learned is always served on the feast day of Saint Lucy, December 13. I thought I’d just post a recipe for cuccia, but the deeper I dug into the history and culture of cuccìa, the more interesting the stories surrounding Santa Lucia and cuccìa became (including that Lucia (Lu-CHEE-yah) and cuccìa (cu-CHEE-yah) rhyme). The upshot is that Lucia became one of the earliest Roman Catholic saints, recognized as such in the 4th century AD, and became the patron saint of Syracuse, of virgins, and of the blind and those with eye problems. 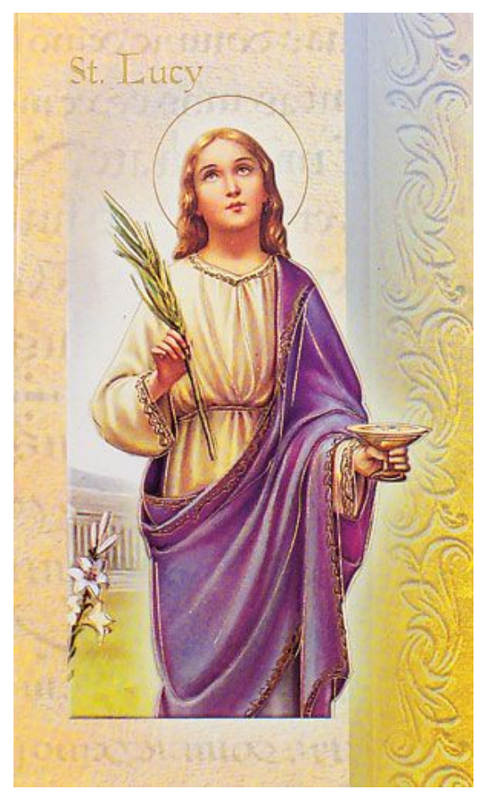 Her Saint’s day is celebrated on December 13, which is said to be the anniversary of her death. Her connection with cuccìa came some 150 centuries later, in 1763 (or thereabouts). The Syracusan historian Giuseppe Capodieci writes that a great famine struck Sicily and the people of the island were suffering and dying. A priest prayed to St. Lucia, telling her that she could provide for her people by sending ships laden with grain. Lo and behold, the very next day, a ship loaded with wheat arrived from the East, and soon after, another ship arrived with grain, and then a third vessel from Dubrovnik. These three ships were followed by another three, all arriving in the port of Syracuse so swiftly and with such abundance that it was declared a miracle. The starving population descended upon the ships, boiled the whole grains, and ate them. This is said to have been the first cuccìa. It turns out, however, that a dish very similar to cuccia existed way back in Greek and Roman times, and likely even back into prehistoric times. Even the Sicilian word cuccia is derived from the Greek kokkìa, meaning grains. Boil spelt with pine nuts and peeled almonds immersed in boiling water and washed with white clay so that they appear perfectly white, add raisins, flavor with condensed wine or raisin wine, and serve it in a round dish with crushed nuts, fruit, bread, or cake crumbs sprinkled over it. 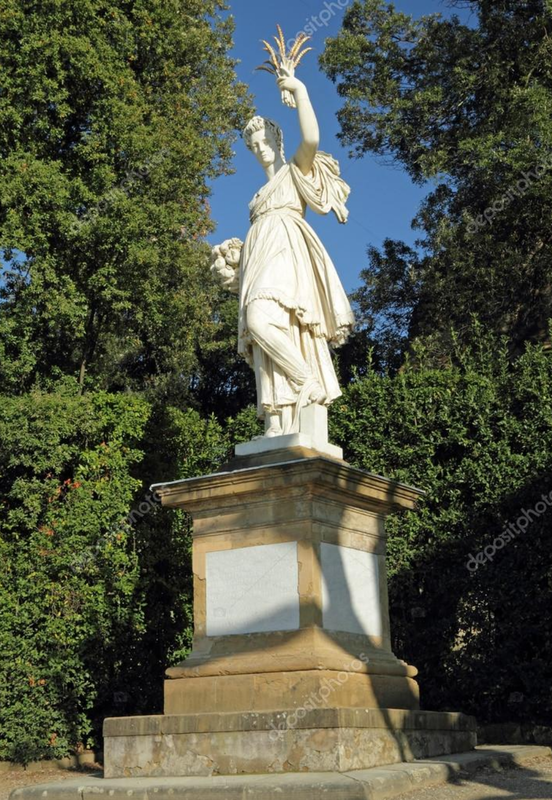 This statue of Ceres holding a sheaf of wheat is in the Boboli gardens in Florence, Italy. Others have pointed out that Santa Lucia and her story and iconography overlapped, and eventually replaced, the story and iconography of Ceres, the Roman goddess of fertility, grain, bountiful harvests, and motherhood (Demeter in Greek). Both Ceres and Lucia are commonly shown holding a sheaf of wheat, and both are associated with light. Although St. Lucia’s feast day is Dec. 13 in the modern calendar, in the Julian calendar it was Dec. 21, the winter solstice and the longest night of the year, signaling the return of longer days. Her very name refers to light (lux in Latin and luce in Italian). The longer days also signal the return of warmth, and the planting of seeds. Benvenuto Tisi painted St. Lucia in 1533 with wheat in her right hand, and eyes on the plate to her left. 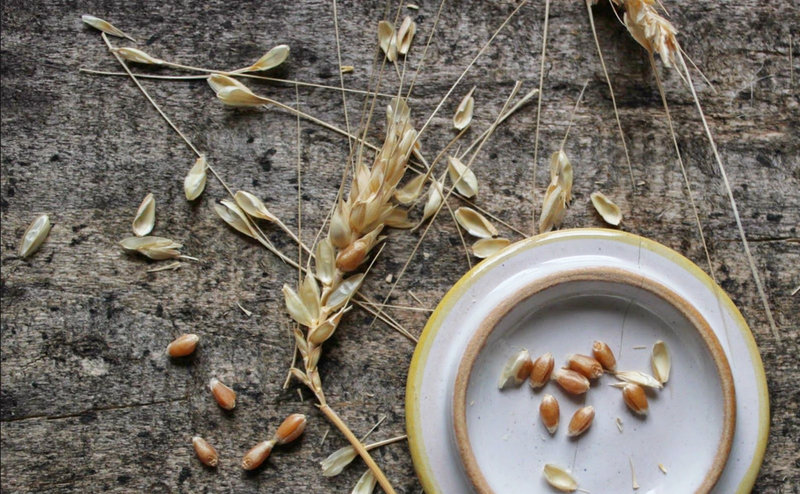 The whole grains in cuccia are seeds, and as such symbolize new life and the promise of a bountiful harvest. The ritual of eating cuccia to honor St. Lucia hearkens back to the ancient Greeks, who prepared a ritual dish of boiled whole grains known as panspermia (all seeds), which they prepared twice a year to mark the coming and going of longer days at the winter and summer solstices. From pre-history until today, seeds and grain remain precious things, and we can honor them, and the people who grow them, with a delicious dish of cuccia. Today there are many variations of cuccia, from a simple savory dish with only salt and olive oil, to luscious dishes made with creamy ricotta cheese and honey, often studded with candied fruit and topped with shaved chocolate. Here’s a recipe we like. If you use our soft red winter wheat berries or rye berries, you don’t need to pre-soak them—simply cook until al dente. If you use hard red winter wheat, soak the berries overnight, or even for a few days, changing the water a few times, before boiling. 1. If using hard red winter wheat, soak the berries in cold water overnight in the refrigerator. Drain and place in a 3-quart pan along with the salt and enough water to cover by 2 to 3 inches. 3. Cover and cook wheat or rye berries at a slow simmer for at least 1 hour, or until tender. Kernels will open up slightly. 4. Turn off the heat, and leave the berries in the pot to slowly cool and fluff up. When the berries are at room temperature, drain them if they have not soaked up all of the water. 5. Combine the cooked grain with the ricotta. For a smoother texture, press the ricotta through a food mill or sieve. 6. Blend in honey to taste, along with raisins, currants, or candied fruit. Turn into a deep serving bowl and dust with cinnamon. Serve warm or at room temperature in small bowls, and top with shaved chocolate if you like.